VCOM is a software based full conferencing and non-blocking matrix communications system that operates using standard computer and IP network hardware instead of the much more expensive proprietary hardware systems that have been the norm and still enjoy great acceptance. It is self contained and fully compatible with external systems such as SIP and analog telephone systems, digital and analog audio systems and control stations manufactured by a variety of companies. VCOM brings a much more cost-effective approach to professional level communications systems while continuing to provide all the expected functionality and in addition all digital IP infrastructure including inherent seamless integration with telephony systems and popular mobile smart phones and tablets. System Administration Application: administrative user control for dynamic configuration and monitoring of VCOM from any workstation on the network. The VCOM Virtual Matrix / Server is our platform’s core multi-threaded, server-side summing/mixing engine with integrated SIP support. Our Matrix is highly scalable to thousands of users, supports virtually an unlimited number of point-to-points, group calls, and PLs (aka conference channels), boasts AES-256 encryption, and is fully redundant. An array of User Interfaces (software / hardware / third-party) are available to meet your specific critical communications requirements. Harness the power of a VCOM Matrix on your private LAN/WAN or choose from one of our turnkey Cloud Solutions. VCOM User Interfaces are available for all major platforms — PC’s, Tablet PC’s, Macs, iOS and Android — and provide point-and-click control for establishing talk and/or listen voice paths. Multiple group and individual voice paths can be established simultaneously and multiple conferences can be accommodated in any complexity. Users may talk and/or listen in a single conference or multiple conferences, in any combination and in any sequence. All basic paths are set up in advance and are “always on” for instant multiple channel access for talking and monitoring. Live Sports Production is very communications intensive. 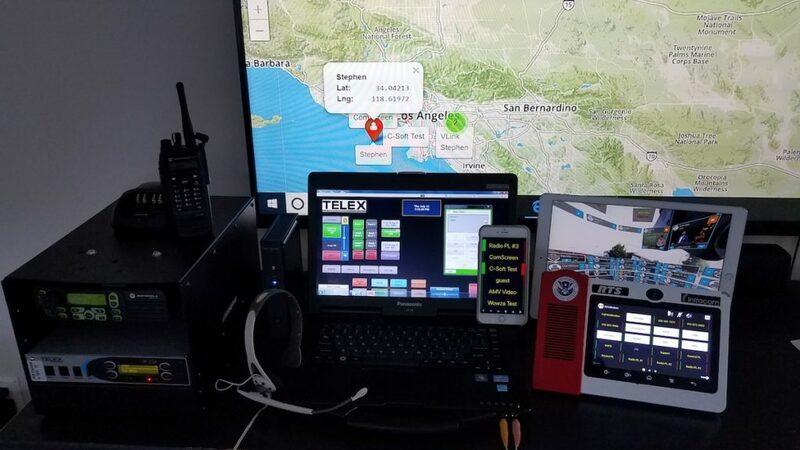 Multiple voice channels as well as many audio program listen and IFB talk path selections must be made very quickly, often from multiple locations some being located away from the primary control point (generally in a mobile production trailer). These include but are not limited to office trailers, additional support trailers and trucks, spotter’s booths, press box, and additional remote facilities, even in an executive’s home or hotel room. 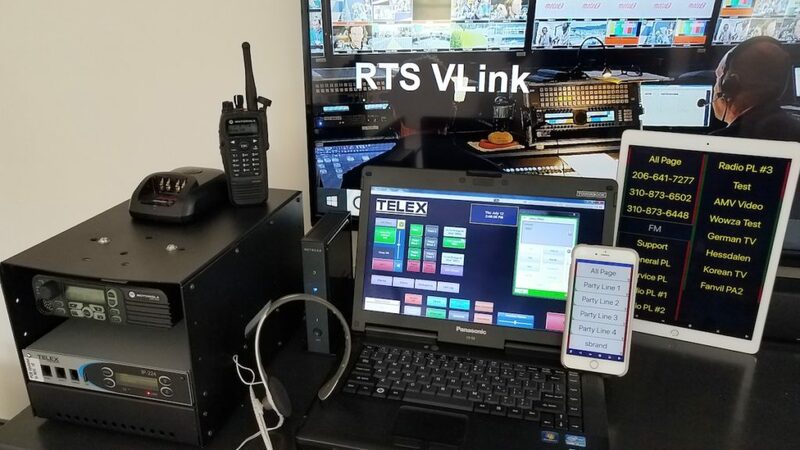 The communications system also must be seamlessly connected with the broadcaster’s fixed location system as well as both internal and external telephone networks. 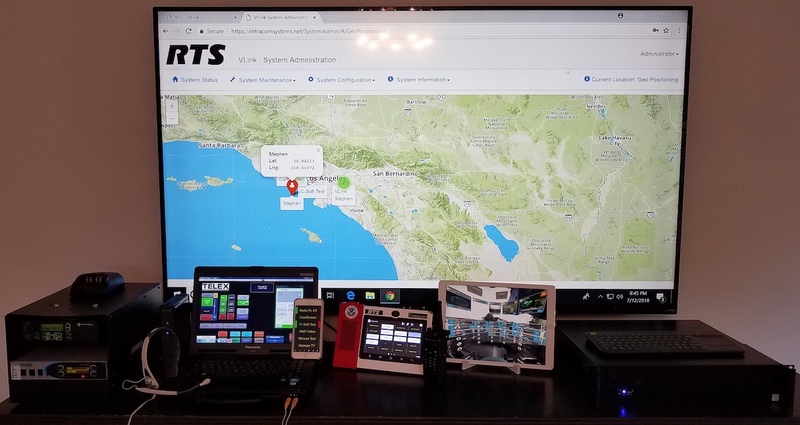 By using VCOM all of these capabilities can be seamlessly integrated into one overall system also allowing full duplex communications which eliminates the need for push to talk operation for operators who have their hands busy doing other things! Push to talk is always available where privacy is necessary. In addition to integrating all aspects of internal communications outside communications with the public telephone network and audio feeds to the press and is also as easy as programming the VCOM system. 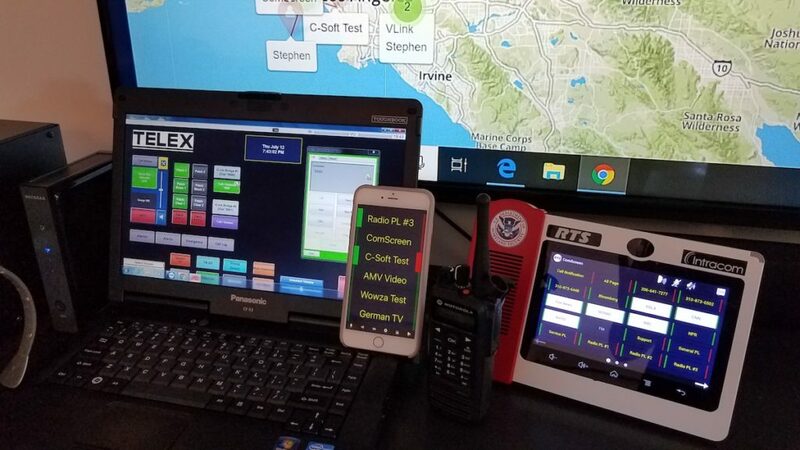 The unique ability of VCOM to integrate all of the existing systems simplifies operator control hardware, instead of multiple devices all controls and audio are easily handled on one device including push to talk walkie-talkie control. This capability can also be located anywhere one can obtain internet data, practically everywhere. Someone at home or in a hotel room can have full access on a smartphone or tablet. Personnel costs are lowered, fewer people can install, maintain, and operate one system compared to several. This flexibility along with high speed internet based data connections has helped lead the industry toward more coordination being done away from the remote venue in order to reduce personnel and travel costs and allow faster set up and take down, again saving money. Current systems, which often include VCOM (VLink as implemented by RTS), are now common. However, one thing that limits the ability to control events form the studio is the lack of realism available to production people located away from the production venue. VCOM VR can now allow that by using the latest techniques to leverage the capacity of data connections and the dropping price of Virtual Reality hardware and software. VCOM VR brings together voice communications, audio monitoring, live and still video, data display, and Geo-Location (real map display), into one signal displayed on either VR Goggles or a pan-able 360 flat panel display. Now remote personnel can feel in the action while not having to be there, they can be “there without being there”. Of course there will always be a need to have some personnel to be at the venue but I some producers, support personnel and executives can be wherever they may be and still actively participate. In addition the same data that is feeding the remote personnel can also be released to the public for a truly immersive watching experience. Imagine being able to see and hear the game such that one would be simulating the experience of a sportscaster or camera operator on the side-lines of a football game! Standing by the net for tennis? Walking down the fairway of a golf course? In auto racing there are already cameras in race cars, so a driver’s view in VR? 360 cameras are now very small and inexpensive and are easily affixed to headgear already similar to that being worn. They are light enough to be mounted on top of headsets and many have self-continued microphones. Each viewer would be able to select his/her own experience based on what listen keys are activated and what capabilities are programmed by the system administrator. Of course only production personnel would be programmed such that they were able to listen or talk to other production personnel but the ability to listen to multiple audio sources and perhaps to speak live with someone at the venue could offer exciting possibilities for serous fans, capabilities that would be like a video game that is actually not a game but a real event. The VCOM VR system can be the final missing element in bringing the game to the operator wherever that operator may be.